As you probably know by now, my boy Tyler is a little bit crazy about trains, so I’m always on the lookout for places to take him to by train that aren’t too expensive. Last Monday I decided to take him to Banbury – it’s £20 for a day return from Slough and is roughly an hour and a half away. We got there at about 11.30, with a change at Oxford, where Tyler got to do some trainspotting from the footbridge. We had a little snack while we were waiting there too. 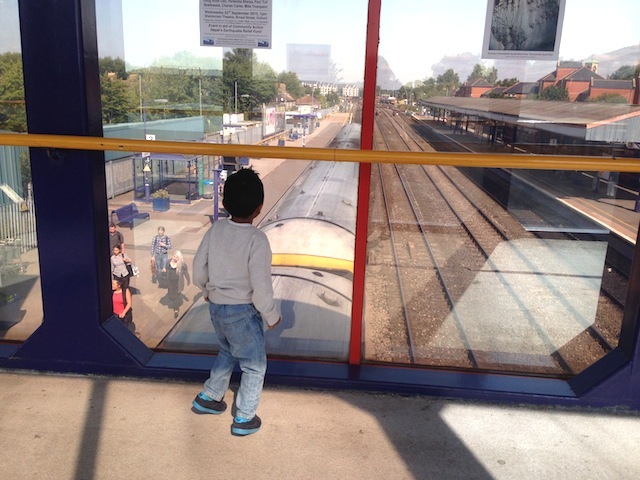 When we got to Banbury station, my little trainspotter was excited to see the Chiltern Railway trains – yes really. “Look, a white train! A WHITE TRAIN!! 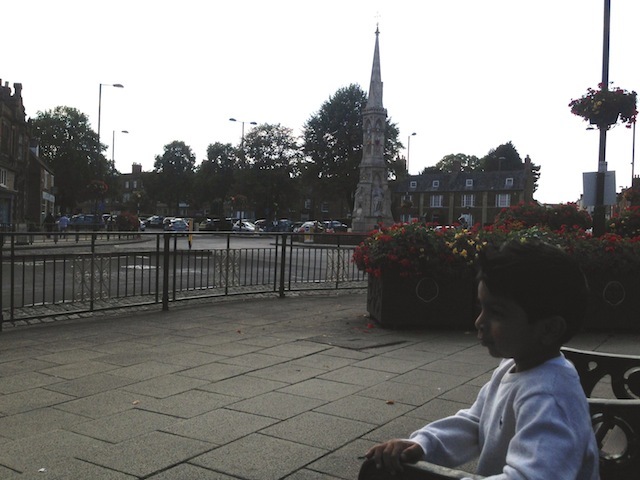 !” We walked down the road out of the station, and turned left – the town centre was just there. We had a walk through the Castle Quay shopping centre, which has all the familiar store names, like Debenhams, H&M, Tiger, M&S. We went into Bhs where I had a nightmare trying to keep an eye on Tyler. He thought it was a big game and was running around and hiding from me. I do sometimes miss those days when he was strapped in a pushchair and I could browse in peace! 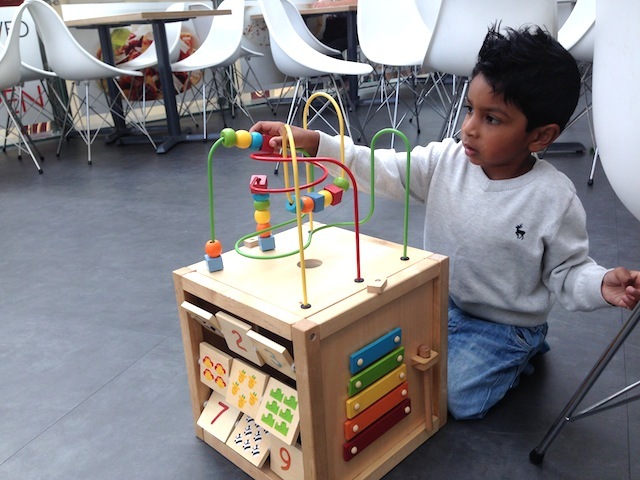 So I decided to take him up to the Bhs Cafe for a milk and sandwich. It’s on a balcony looking over the shopping centre, under a glass roof so we got all the sunshine. Tyler was so good sitting down to eat his lunch, and then he played with this toy they had there for a while, and I got to catch up with reading my book. 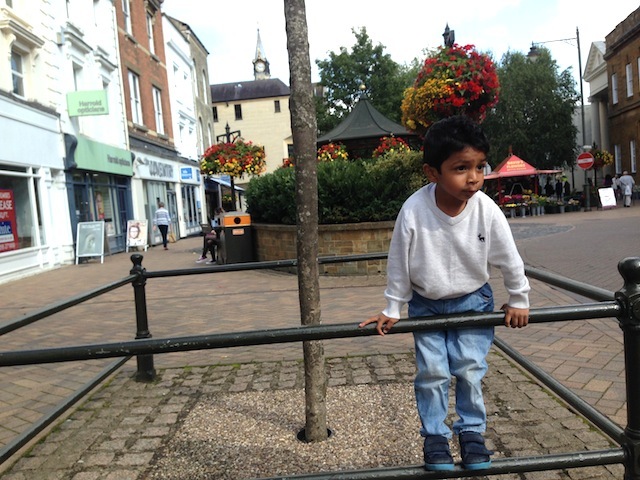 I got him to the top of the High Street eventually, with a lot of stopping in doorways, to get to see the famous Banbury Cross. 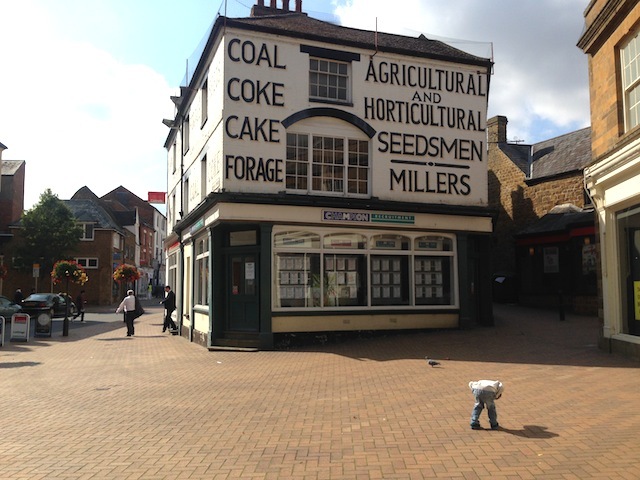 Then we walked back down the other side of the High Street, where I took pictures of buildings that interested me. 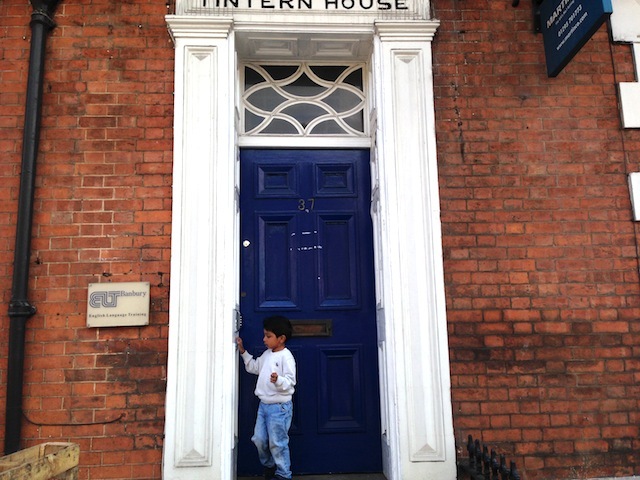 I liked this blue door and the Tintern House writing. All the shops on the High Street are in really pretty character buildings. Even the McDonalds looks pretty. 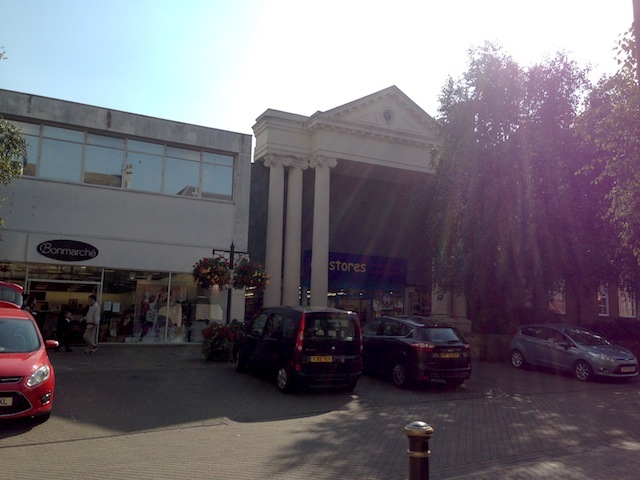 And Banbury must have the grandest 99p store in the country – look at those pillars. That really made me laugh. 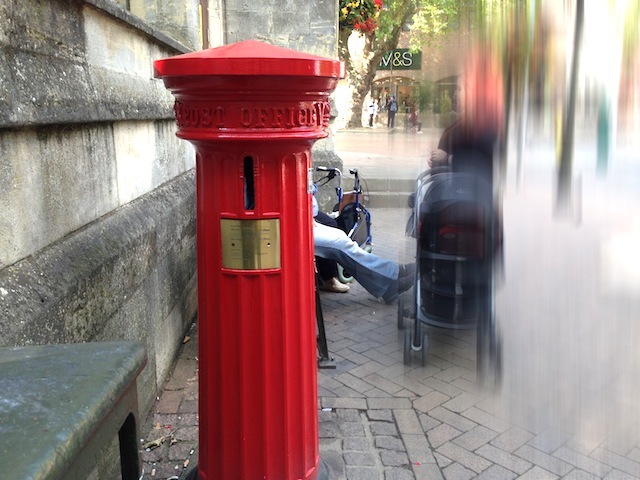 Even the post box looks a bit different from the norm. 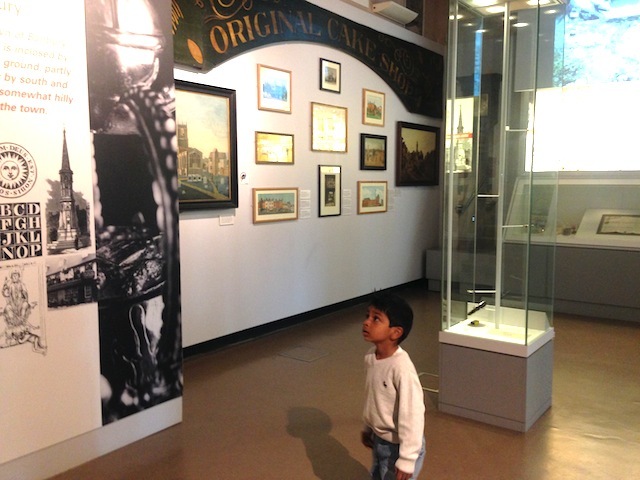 After our wander down the High Street, we went back into the Castle Quay shopping centre to visit Banbury Museum. It took a while to get there, as Tyler decided to crawl for fun. I was like, Tyler, why??? Anyhoo, we got there. We had to walk through a footbridge over the Oxford canal. The museum is free entry, and I actually found it really interesting. 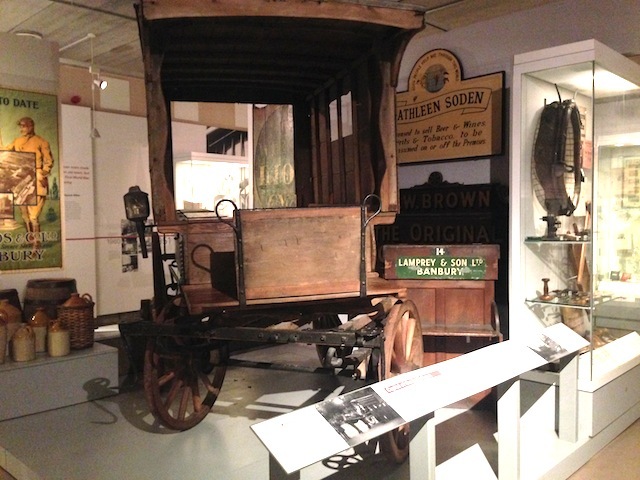 It’s about the history of the area, what industries were big in the olden days etc. There was a weave machine which Tyler liked trying out, and lots of drawers to open! 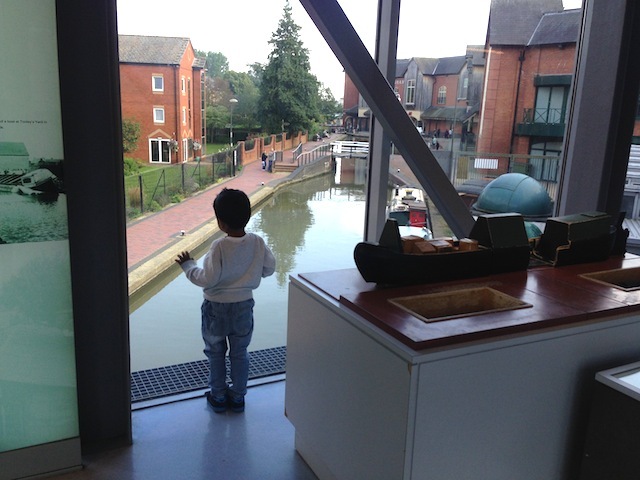 We went downstairs through the museum cafe, which leads on to the canal. 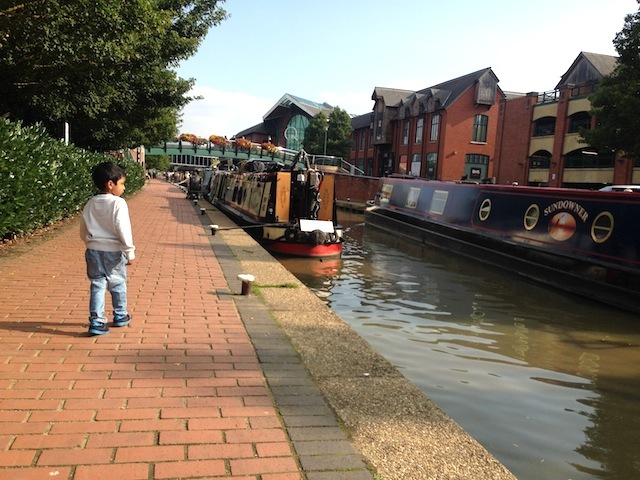 This is where Tyler decided to follow the narrow boats up and down the canal – good exercise for me! He even followed the man that got off the boat in order to open the drawbridge! 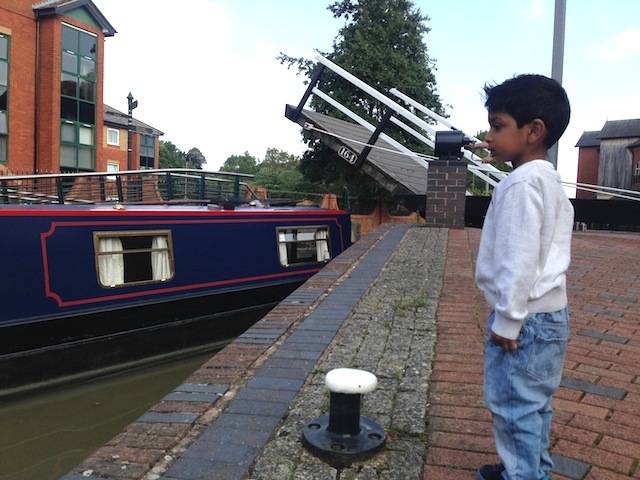 We were here for a while as there was a bit of a canal jam as another one was coming in the other direction in the lock and one behind – all very exciting for Tyler. After that, I called it a day. We popped into M&S to buy some dinner (Cottage Pie!) and then made our way back to the train station. The boy was knackered, he fell asleep on my lap while we were waiting on the platform and slept all the way to Reading. He woke up when we changed at Reading, and it was like the best thing ever for him. He gasped, “The London train. THE LONDON TRAIN IS GOING!! !” “A high speed train! Another high speed train! !” “Quick, let’s get the blue train!” – Seriously, forget the day out, maybe a day in Reading Station would be enough for him! P.S. 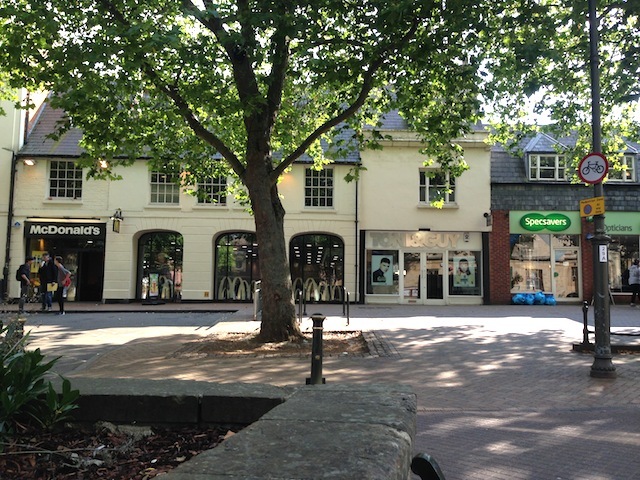 I also put my Woolies Detective hat on and wrote a post about the old Banbury Woolworths – it used to be where Mothercare and Santander are now on the High Street. Have a read here if you fancy. It looks like a really nice day out! 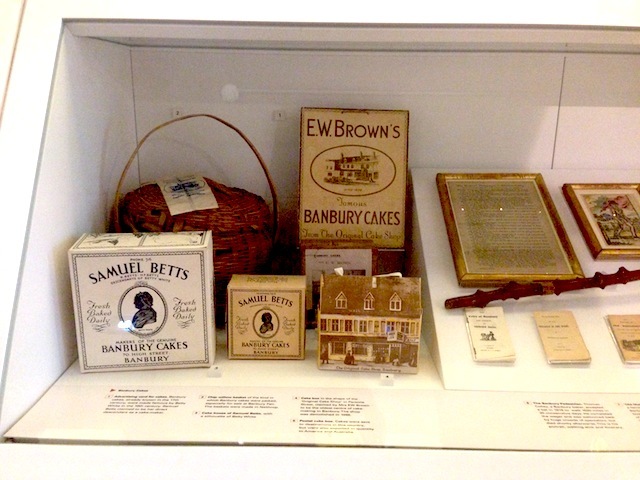 Banbury isn’t far from my in-laws and I really like the look of it, we’ll have to pay a visit! Love that you visited my hometown. I don’t think anyone’s ever said that McDonalds looked pretty too, but looking at it with visitors eyes and the setting I suppose it does. You’ve seen more of the museum than us – we’ve only done the bridge area for a special kids science event, really must do the rest. It’s such a pretty town, laughed at the 99p store, how grand! I just realised that I had always thought that the song about Banbury cross was Bamburgh cross as we had gone on holiday there as a child! Ha ha, oh well, I stand corrected now! I love how excited Tyler was at the trains and that you were told to sit down so he could run round the tree. 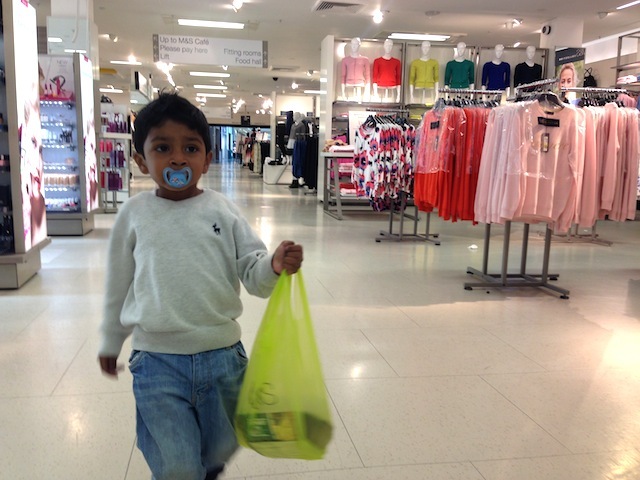 Kids really do know that the best things in life aren’t the expensive days out!